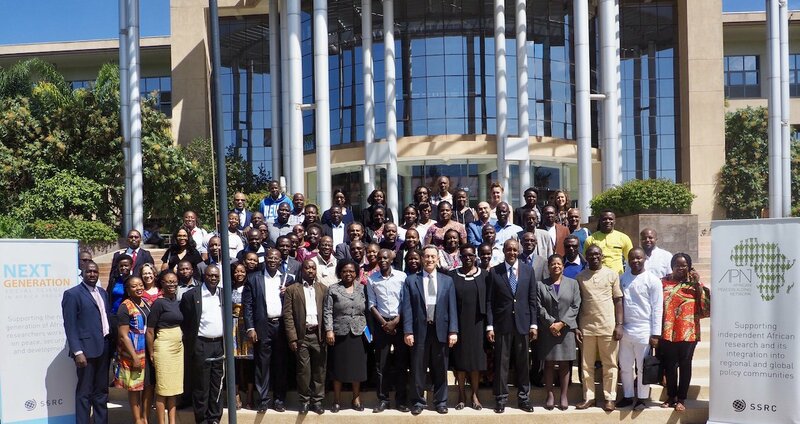 The African Peacebuilding Network held a three-day Writing and Dissemination Workshop in Nairobi, Kenya for the 2018 cohort of APN Individual Research Grant (IRG) recipients from January 9 to 11, 2019. The workshop, organized in collaboration with United States International University-Africa, focused on the writing and dissemination of research findings by grantees after six months of APN-supported field-based research projects across the continent. The fifteen APN Individual Research Grant recipients—representing eleven African countries—benefited from lectures, working group sessions, and one-on-one dialogues with experienced scholars, including APN Alumni and current and former APN Advisory Board Members. Topics included academic publishing, theoretical frameworks in peacebuilding, using gender as an analytical tool, and the use of new and social media to engage, network, and share research results and publications. The small working groups that grantees meet in during the breakout sessions allow their mentors and peers to constructively critique their manuscripts. The goal of these activities is to help participants convert their research data into publishable journal articles, books, book chapters, and policy briefs. On January 9, SSRC Vice President of Programs Ron Kassimir and USIU Professor Kennedy Mkutu opened the joint morning session which linked back-to-back Next Gen and APN workshops. Notably, this session bringing the two Africa-focused programs together was the first of its kind. SSRC staff are working to develop synergies between both programs, which offer support to PhD students and early-career post-doc researchers respectively. The first keynote lecture, titled “UN Peace and Security Architecture and the Challenge of Sustaining Peace in Africa: Challenges, Shifts, and Impacts,” was delivered by Ambassador Macharia Kamau, Kenya's Principal Secretary in the Ministry of Foreign Affairs, who was introduced by USIU-Africa Deputy Vice-Chancellor Amb. Prof. Ruthie Rono. Prior to his appointment as PS, Amb. Kamau was Kenya’s permanent representative to the United Nations (2010-2018) where he served in several prominent roles, including chairperson of the UN Peacebuilding Commission. He spoke on the state of peace and security in Africa, emphasizing that though much progress has been made in reducing violent conflict on the continent, there are still large numbers living without the assurance of peace and security. Amb. Kamau also discussed the relationship between research and policy, highlighting the need to bridge the gap between what is being researched and what practitioners are experiencing. Prof. Kenneth Omeje, a former APN grantee and current advisory board member, spoke on "Emerging Perspectives and Issues in African Peacebuilding." He described the development of the concept of "peacebuilding," tracing it from Johan Galtung to former UN Secretary-General Boutros Boutros-Ghali’s 1992 landmark Agenda for Peace, and beyond. Prof. Omeje highlighted two perspectives on peacebuilding: the "Orthodox Peacebuilding Paradigm," which makes the state the center of peacebuilding, and the "Integrated Peacebuilding Paradigm," which has a more inclusive approach. The next lecture was delivered by APN Advisory Board Member Prof. Rita Abrahamsen and was titled "The Dangers of Securitization: Towards a Global Political Economy of Conflict and Insecurity." She argued that the merger of security and development is a new form of militarism that has gained force by mobilizing the dreams of development. Prof. Abrahamsen noted that poverty and underdevelopment have been securitized, taking on the rhetoric of "threat, vulnerability, defense" which shapes policy action along a particular path. She encouraged grantees to use their research to challenge these kinds of dominant paradigms—even if they seem like the norm—as they can have harmful effects. The final speaker of day two was Prof. Temitope Oriola who, as joint editor-in-chief of African Security, provided an editor’s perspective on “Strategies for Disseminating Research Findings through Peer-Reviewed Journals.” Among the topics he touched on were: writing style, use of evidence, doing innovative and original research, methodology, and theoretical frameworks. Prof. Oriola encouraged grantees to seek help from senior colleagues, be prepared to go through multiple drafts, carefully select an appropriate journal, and understand that rejection is a normal part of scholarly publishing. 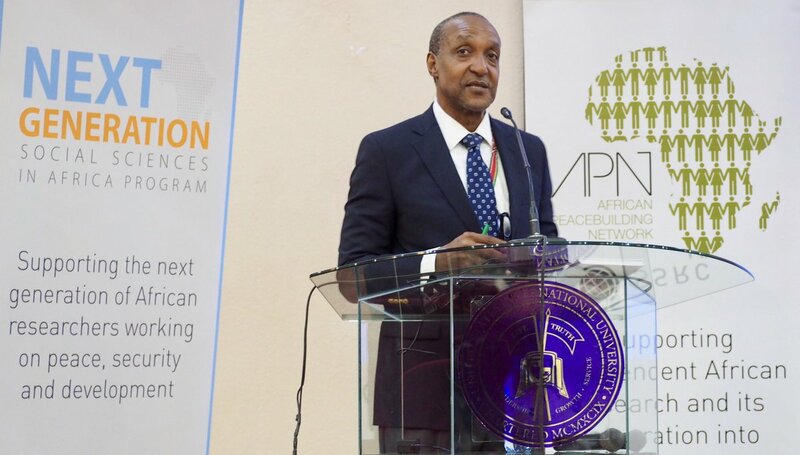 APN Advisory Board Chair Prof. Ismail Rashid gave the closing lecture of the workshop titled "From Writing the Manuscript to Publication: Personal Reflections on the Strategies, Hows, and Whys of Knowledge Production in African Peacebuilding." He presented a broad overview of the process through which research data become publications, for example, choosing the right format and platform; writing book proposals; and the practical differences between publishing books, edited volumes, and journal articles. He urged grantees to not simply publish their data, but also to make sense of it by developing theoretical frameworks to contribute to larger social and political debates. Prof. Rashid also encouraged grantees to contribute to APN platforms as a way of honing their writing skills. During the final plenary session, representatives from each of the small working groups gave feedback on their experiences at the workshop. Grantees described how the lectures and breakout sessions impacted their research/writing projects. Several connections were made between grantees working on similar or complementary topics across, national, regional, and disciplinary boundaries. Many of the manuscripts will be revised and submitted to peer-reviewed journals, book publishers, and the various APN publications (Kujenga Amani, Working Papers, and Policy Briefing Notes) in the coming months. The APN also organized an excursion to the National Commission for Science, Technology and Innovation (NACOSTI) in Nairobi which was an opportunity for participants to learn about Kenya’s research priorities and the process for getting approval to conduct research domestically. APN grantees and Next Gen fellows also attended a group networking dinner.